Home > Camp, Walk, Ride > Which Garden Plants are Safe for Children? It's lovely to explore the garden and park with your children, but they do have a tendency to use all their senses to explore - touch, smell, sight, sound and unfortunately taste is a big one for them! The smaller the child, the bigger the urge to stuff everything into their mouth and plants (and snails, in my daughter's case) are no exception. You will need to supervise you children all the while they are playing in the garden until they are old enough to learn that they must not touch or eat the plants. Many parents find that it's possible to fence off a safe area of the garden near the house for their child to play in. Some flexible playpen systems are suitable for use in a garden as well. That's fine when they're toddling, but as they get more active and explore the border and trees you will need to ensure they know the dos and don'ts of the garden in terms of how to treat plants. Knowing which plants are safe to eat could also save your child's life. Mushrooms are difficult to identify and on an afternoon stroll through the park or woodland, children can often have picked and tried a mushroom before you've even caught up with them and unless you can identify every wild fungi at fifty paces, it's best to stress that all mushrooms are off limits for touching and eating (even touching one and licking fingers can cause stomach problems). There are plenty of other poisonous plants; some of which you might not imagine could harm you. Rhubarb, for example, contains oxalate crystals, and can cause poisoning when large quantities of raw or cooked leaves are eaten (this happened quite often in World War I, when rhubarb leaves were recommended as a food source). Rhubarb also contains chemicals called glycosides (the same groups of compounds that make foxgloves and lily-of-the-valley dangerous). These are found low in the stalks, so the message is only to ever use the middle of the stalks of rhubarb. Sweet peas may be another villain in disguise as the seeds are particularly poisonous. Don't forget to check the plants inside your home too. That Swiss-cheese plant (split-leaf philodendron) may have sat harmlessly gathering dust for years but the leaves could cause problems if chewed by a baby. General symptoms of poisoning include blistering of the skin, hoarseness, irritation of the mouth and, allergic reactions and itching. Take a careful look around your home to make sure you don't have any hanging plants or plants on top of furniture that your child might be able to reach. Pebbles in plant pots can be a choking hazard, and toddlers have been known to eat the soil from plant pots as well. The simplest solution is to move any plants up onto high up shelves or into a spare room and keep the door closed and locked. Before you panic and rush off to convert your garden into a Japanese art form of stones and water, keep things in perspective. Research has shown the risk of harm from plant poisons is low - less than one in 10 million, or about the same as the chance of winning the lottery or being struck by lightning. Why not start a weekly walk with your children to show them the beauties and the beasts in your garden? Here are some of the more common (and seemingly innocent) plants and what they might cause if touched/eaten.. They grow in many a garden and we all remember how to hold them under each others chin to see who likes butter. But make sure they don't get eaten as they will cause serious damage to the digestive system. Be careful handling them too, as enough of the sap rubbed into your skin will make it blister. Given to Mums everywhere on Mothers day, the pretty, yellow daffodils growing in your garden could cause diarrhoea, vomiting, and nausea when ingested. They have proved fatal in the past. Given as a bunch of flowers or grown as a plant, the leaves and stems of these can cause dermatitis. A few berries from a Daphne plant can kill a child, easily. Children in the past used the pithy stems of the elderberry as blowguns. Any part of the plant can cause a nasty tummy upset, so don't teach them how to make blowguns from this plant! 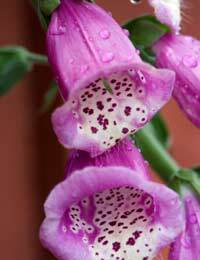 Foxgloves have been grown in the English country garden for generations, and almost everyone knows that it's poisonous. It causes irregular heartbeats, as well as mental confusion and digestive upset. It has also proved fatal. The bulbs of these are easy to grow and often a starter project for budding gardeners was to grow a hyacinth bulb - but watch them closely, as the Hyacinth, just like the Daffodil can prove fatal, if eaten.